We are thrilled to officially announce that we have begun the process of relocating to a brand new home. Oxbow Animal Health’s new facility in Papillion, Neb. will support our commitment to providing innovative, ultra-premium products to you and your pets. 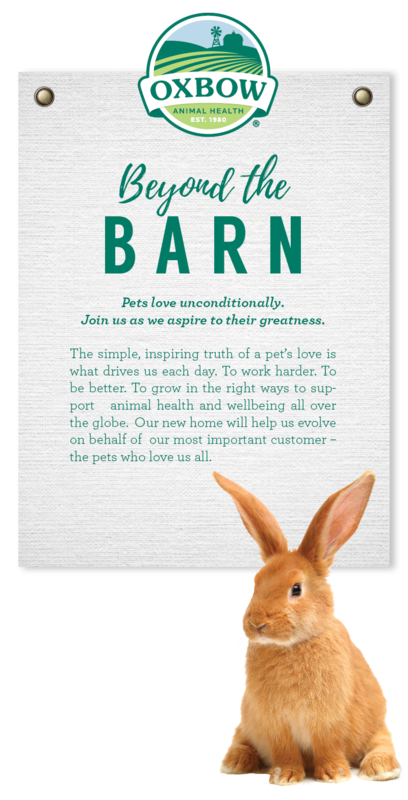 With all of our operations under one new roof, we look forward to continuing our mission of improving the health and well-being of small animals, as we grow and evolve for many years to come. Intuitive, industry-leading systems and processes will help us preserve ingredient quality on our way to achieving and re-achieving the product quality you’ve come to expect from Oxbow. More controlled conditions company-wide will help us take quality control to a new level. A new, dedicated quality laboratory will allow us to better scientifically measure Mother Nature in a controlled setting. Our new home will help us expand our horizons through advancements in systems, technologies, and infrastructure. These advancements will benefit all who interact with Oxbow, from partners to pets. Every Oxbow employee is a member of the Oxbow Family. From community fellowship and collaboration spaces to expanded comfort controls campus wide, our new facilities have been designed with the Oxbow Family in mind. With all of Oxbow under one roof and improved access to main roadways, we will see improved efficiencies and a smaller carbon footprint than ever before. Every Oxbow employee is a member of the Oxbow Family. With dedicated community spaces, comfortable locker rooms, and inspiring areas for innovating and strategy, our new campus highlights our dedication to our greatest asset – our people.